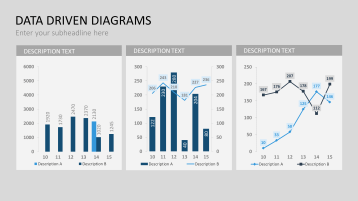 Diagram collection linked with Excel to illustrate important numbers and figures. 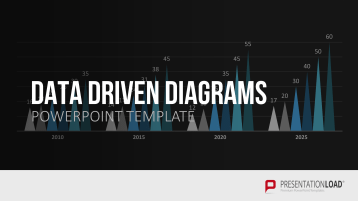 Data-driven diagrams in forms of column, line, bar, doughnut, radar, area and many other charts to illustrate economic figures and to quickly compose professional charts in PowerPoint. Most businesses deal with many different numbers and process data in various forms. Diagrams are the easiest option to process such data and to express relations, developments and distributions. 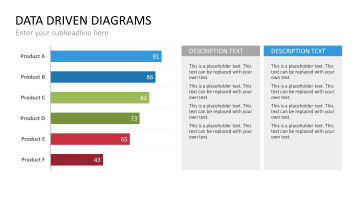 Just choose the type of diagram that is suitable to illustrate your content. Due to its link with Excel, all diagrams which are included in the set can be easily filled with numbers and adjusted to illustrate your business figures. Find combinations of column and line chats, waterfall diagrams, clustered column and bar charts, stacked column and bar charts, pie charts, line charts with markers, stock diagrams and doughnut charts in many different variations. Additional slides combine diagrams with each other and allow you to demonstrate relations or similar developments. 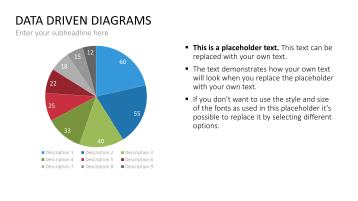 Use slides that combine text boxes and diagram illustrations to insert additional information and definitions.